ABKT Tactical Cleaning Kit (30.00) – Everyone needs a cleaning kit. And, all kits are not created equal. We have used these exact kits for about 2 years now. These kits set themselves apart with their hard inner-shell that keeps things organized and crushproof. Also, the cleaning rod is higher quality than most that we have seen. In our 2.5 years in business we have sampled about 15 different cleaning kits. This one is our favorite. 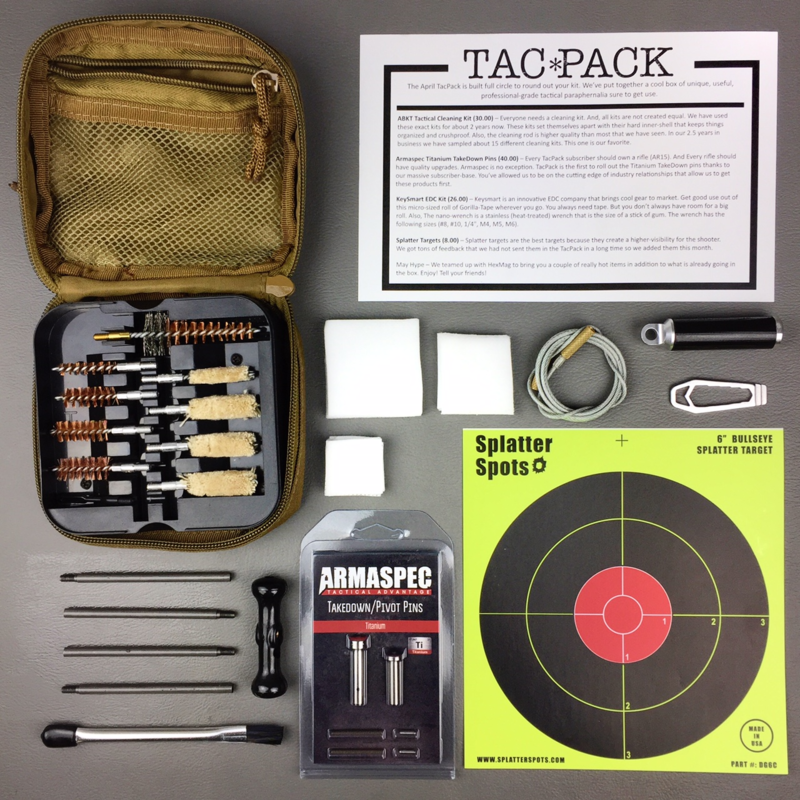 Armaspec Titanium TakeDown Pins (40.00) – Every TacPack subscriber should own a rifle (AR15). And Every rifle should have quality upgrades. Armaspec is no exception. TacPack is the first to roll out the Titanium TakeDown pins thanks to our massive subscriber-base. You’ve allowed us to be on the cutting edge of industry relationships that allow us to get these products first. KeySmart EDC Kit (26.00) – Keysmart is an innovative EDC company that brings cool gear to market. Get good use out of this micro-sized roll of Gorilla-Tape wherever you go. You always need tape. But you don’t always have room for a big roll. Also, The nano-wrench is a stainless (heat-treated) wrench that is the size of a stick of gum. The wrench has the following sizes (#8, #10, 1/4″, M4, M5, M6). Splatter Targets (8.00) – Splatter targets are the best targets because they create a higher-visibility for the shooter. We got tons of feedback that we had not sent them in the TacPack in a long time so we added them this month.